The Never Tap Knee Guard keeps it simple, featuring a gray exterior with indigo details. The inside is indigo with blue details that indicate where the support on the guard can be found. I prefer to wear spats when I train, so I wore my knee guard underneath them. Although you could definitely tell that I had something on my knee beneath my spats, it wasn’t so bulky that it was distracting. For perspective, I’m a 5’2″ tall woman who weighs about 125 lbs. My size-small knee guard provided a snug, but comfortable fit. My knee felt supported, and the guard didn’t constrict my leg when I moved it. I preferred to wear my knee guard a bit lower than I’ve seen it on other athletes, adjusting it to where I felt it offered the most support for my old injuries, but I felt no difference in support or comfort compared to when I wore it a bit higher up. The guard was easy to slip on, and even though it was harder to simply slip off when I was sweaty after training, it was easy to remove by flipping it inside-out starting from the knee and moving downward. Given that the NeverTap Knee Guard wasn’t uncomfortably tight, I was pleasantly surprised at how well it stayed put during intense rounds of training. I didn’t have to adjust it when I wore it under my spats, but when I tried to wear it over them just to see what would happen, it slipped off quickly. I wore the guard predominantly on my left knee (which has sustained more injuries than the other), but also experimented with wearing it on my right knee for comparison. Drilling takedowns was infinitely more comfortable thanks to the gel-like insert near my kneecap, and the supports on the sides of my knee made me feel like I was a lot less likely to injure myself by stepping or moving the wrong way. 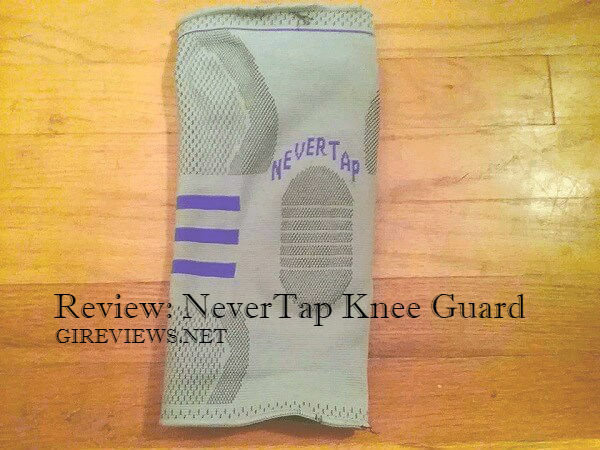 The NeverTap Knee Guard is also comfortable, and it didn’t distract me while I was wearing it. I never felt like I had to adjust it due to itchiness or bunching up, and after a while, I was so used to it that I barely noticed it was there. I’m a pretty “bendy” grappler, and I never once felt like I couldn’t roll normally while I was wearing the knee guard. Although I sustained unrelated injuries while testing out the knee guard, none of them happened on or around my knee. The feeling of my knee having better support seemed to be validated — I didn’t have to take any time off training due to achy tendons and ligaments, and my leg felt stronger overall while I was wearing the knee guard. The NeverTap Knee Guard held up pretty well through months of training and numerous washes. The nylon inserts didn’t poke out, bend, or move around, and I didn’t notice any signs of wear and tear where it would impact the functionality of the guard. However, there were a couple of elastic threads that came loose at the top and bottom of the knee guard after about a month of use. They were easy enough to snip off with scissors and didn’t affect the fit of the guard, but I can’t say if that would be the case a year or so down the road. Even though I’d never found it necessary to wear a knee guard before, the NeverTap Knee Guard may have changed that. The comfortable, consistent support that it offered made training more comfortable and lessened my concerns about knee injuries. The only downside that I could find after a few months of use was the loose threads, but since they didn’t impact the fit or function of the guard, I don’t have any complaints about the minor wear and tear. Overall, I’d recommend the NeverTap Knee Guard to anyone who wants to reduce the routine damage done to their knees by takedowns or tough training. To get one for yourself, visit the NeverTap website.